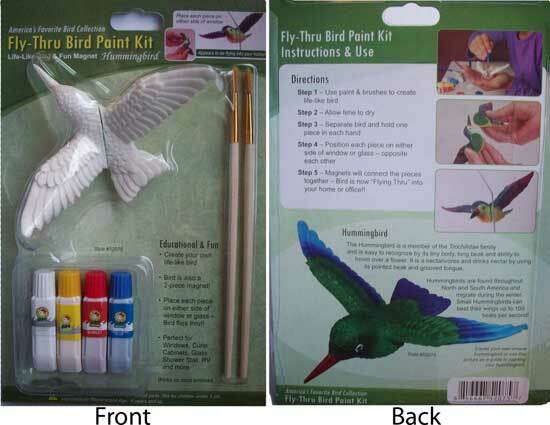 The Hummingbird Fly Thru Paint Kit is a great kid's activity. Use paint and brushes to create a life-like bird. Position each piece on either side of a window or glass the bird is now Flying Thru into your home or office! Create your own life like bird flying through your window, glass shower stall, cabinet glass or RV. Place each piece on either side of glass, a 2 piece magnet connects the pieces together. Paint the hummingbird with the included paint, Blue (Pantone number 280C), Green (number 349C), Burgundy (number 1815C), and Black. Separate the bird and hold each piece in each hand or have a friend hold one piece and you the other. Place on each side of a window or glass opposite each other. The magnets will hold each piece onto the glass and connect the pieces together. Now you have a hummingbird flying through your window or other glass panes.